In the Gong Research Labs series, we publish data from analyzing sales calls with natural language processing and AI. Subscribe here for new data every week. How embarrassed can one guy be? One of the key reasons I was invited to join Gong as Senior Director of Product Marketing was my sales experience at InsideSales.com. My executive team valued that background to a great extent, and arrogantly enough, so did I. So when I hopped on my first few sales calls at Gong (using the platform to measure my own talk-to-listen ratio), I thought I had it made. On full-length calls, I figured I was speaking somewhere between 45-55% of the total call. I couldn’t wait to see the actual averaged-out results from multiple calls to validate the high opinion I had of my own sales skills. That Friday, I received an automated Gong summary email. I could finally check some of my sales conversation stats, including my average talk-to-listen ratio. I slowly clicked to open the email, scrolled my eyes down to the center of the page, and almost choked on my coffee because of what I saw. My average talk-to-listen ratio was 72:28. And everyone knew it. I’m sure my face immediately became flushed red. It turns out, my experience is not uncommon. Unless you are actively monitoring your own talk-to-listen ratio with technology, it’s likely that you’re speaking much more often than you to believe. During the first cohort of Gong’s conversation analytics research series, we analyzed 25,537 B2B sales conversations using artificial intelligence. The analysis revealed that the average B2B sales rep consumes 65–75% of a call’s talk time speaking rather than listening. When this ratio is tracked with technology, you’ll see it sharply and suddenly decrease in favor of more listening. As I mentioned, when I first started at Gong, my initial average talk-to-listen ratio was 72:28. Fortunately, on the occasional sales call I still join in on, I trend around 52:48 these days. The act of tracking and measuring almost autocorrects an out-of-balance talk-to-listen ratio. But wait, let’s back up. Is that something we should even be striving for? 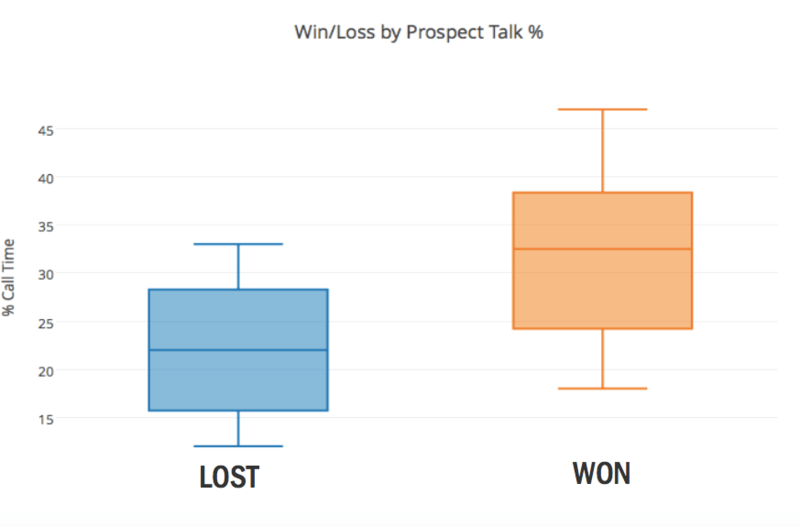 Does a lower talk-to-listen ratio actually lead to more positive sales outcomes? 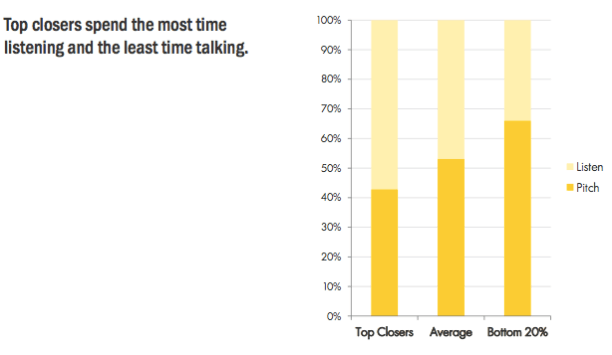 How often do the highest performing B2B sales professionals speak vs. listen? The analysis revealed that the highest converting talk-to-listen ratio on B2B sales calls is approximately 43:57. It’s likely that the “ideal” talk-to-listen ratio is going to change depending on the stage of the sales cycle (keep your eyes peeled for future research on that!). Remember: correlation and causation aren’t always paired together. When I say 43:57 is the “highest converting” talk-to-listen ratio, what I mean is that ratio was the average ratio for successfully progressing deals to the next stage in the sales cycle, as well as closing the deal at the end of the sales cycle. Finally, if your sales reps are talking too much, increasing your potential customers’ average talk-time from a mere 22% up to 33% (an easily attainable jump) significantly drives win-rates upwards. In cases like this, it doesn’t take much to see the first glimpse of positive results. If you’re a B2B sales veteran, you can give yourself a pat on the back. You probably knew by intuition that speaking less and encouraging your customer to talk more most often leads to the pot of gold at the end of the rainbow. And it feels great to have data validate our own intuition. That said, if you think you have your own talk-to-listen ratio down-pat, I’d double check. Try a free trial of Gong to measure a few calls.